Jakarta Provincial Government holds Gelar Produk Industri Kecil dan Menengah (IKM) 2018 event at ground floor of Block G, City Hall, Jl. Medan Merdeka Selatan, Gambir, Central Jakarta.
" We will also open similar exhibition in other places"
Gelar Produk IKM 2018 is held from July 16-19 with theme "Peningkatan Daya Saing IKM dan Industri Kreatif Dalam Rangka Menyongsong Industri 4.0" and participated by 54 IKM (small medium industries) actors. 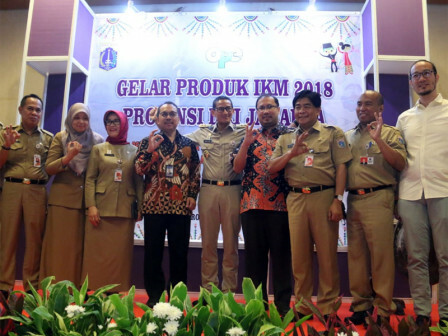 Jakarta Vice Governor, Sandiaga Uno said, this event is held to promote and market IKM products in Jakarta. "In OK OCE perception, when we give a chance to IKM and UKM to promote their brands, they can improve their income, market access, economy, and create job opportunities," he mentioned after event opening, Monday (7/16). He wants similar exhibition could be held in shopping centers. Thus IKMs can promote and market their products massively. "We will also open similar exhibition in other places. Thus IKM and UKM can provide solution of our problems which is improved people's business and create more job opportunities," he added. Meanwhile, Jakarta Industry and Energy (PE) Dept. Head, Yuli Hartono mentioned, tens joined participants are from IKM under PE Dept. coaching. They sell culinary, fashion, and handicraft products. "We are determined to create 200,000 new entrepreneurs from OK OCE priority program. We will train, develop OK OCE environment and try to open stalls for expanding business network and marketing products," he affirmed. He explained, IKM can join exhibition after get training at sub-district level and Jakarta National Craft Council. "This event becomes business trials for them to set their creative ideas," he mentioned.